SDL-makers Galaxy Gameworks are looking for a talented developer who would be interested in developing and maintaining SDL. Pfunked might support artists starting their own funding campaigns for creating art for FLARE, as he did with Justin's. Here are some asset ideas. Then there's the option to offer high-quality art for being 'funded into free' at OpenGameArt. The current target is $130 for this dwarf warrior. I wish there were (more) open source projects at 8bitfunding, Kickstarter, Fundry and IndieGoGo. The only open source game dev projects I found are a flash game (successful), FAR Colony and an interactive fiction engine iphone port (successful). I'm sure not only full game projects could make use of these fundraising services but free content creators as well. Then there's a game competition by the Slick java game engine. 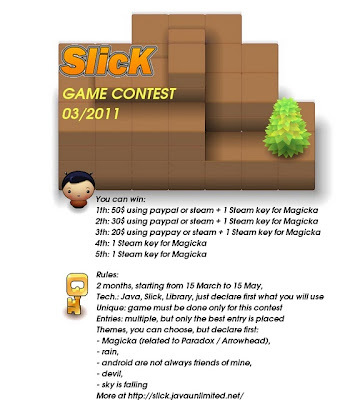 Check the image above for rules and prizes. PPS: Wesnoth is still offering $200 for a swamp sound loop.